Interview by Katie Gravely. Photography by Yashira Afanador. That’s a big question! Well, my name is Morgan Angelique Owens. Born and raised here in Cincinnati by two wonderful parents, Dr. O’dell and Marchelle Owens. My dad is a physician by trade, but he’s been a renaissance man throughout the city, and my mom is a schoolteacher – second grade – and she works for CPS. I have two older brothers and they both live here. What else? I love pink! I love to shop. I love to work; I like to do work that means something every day. I like to go out and have fun with my friends and family when I can. I am in love with my dog, a puppy named Ralph. Tell me about Curvy Cardio! So Curvy Cardio started back in 2014. Really, it was a hustle because when I graduated college, I worked four jobs at once. I graduated in ’08 when the recession kind of hit and I wasn’t really the kind of person that knew what I wanted to do. In college, I wanted to go to law school then changed my mind. I was a psych major for like a month and then I settled upon English/creative writing for my major because I felt if you can write, you can do anything. I worked literally from 7 a.m. and got home at 10 p.m. I really just took every opportunity that I could and I think that’s the foundation of where I am today. I’m not afraid to work. After college and coaching for two years, I got interested in Zumba. I said, “Oh, I can do this and make money while doing it,” so I did that for two years and loved Zumba, but really didn’t follow the formula for it and I wanted to do my own thing. My boss was like, “Why don’t you?” So Curvy Cardio came about. I made a conscious decision at 27 that I was going to love my body, no matter what size I was in or what shape. The first year was like a hustle, so I didn’t really take it seriously in business. When I saw that it could be something, that is when I branded and got a retail line. I knew it was something because I started telling my story. I was 26 when I started Curvy Cardio, and I’ve dealt with self-esteem issues and body issues all my life. I went to schools where no one barely looked like me. I had thick thighs in fourth grade and I kind of developed a complex about myself. At home, I got all the love, but school is where you spend most of your time. I was a happy kid, and my parents didn’t know about how I really felt about myself. I was a cheerleader; I was on the dance team, and I was voted best sense of humor, but internally, I struggled. The purpose of Curvy Cardio is to promote self-love from the inside out. I made a conscious decision at 27 that I was going to love my body, no matter what size I was in or what shape. The purpose is to get in shape but not body shame anyone or feel like you have to come to class and go on this strict diet. I meet you where you are. Have fun and have confidence in yourself. Where do you see Curvy Cardio going from here? I know you have WerkBooks, too, so how does all that work? Actually, the Werkbooks are my second business. Last November, I wanted to do a workshop called “Babes in Bizness.” Coming from a corporate world, I feel like women, we can dress up or down, but we can still get the job done. So in the corporate setting, I really didn’t see a lot of women who looked like me either, so I was like, I want to do something about it. I wanted to do a workshop with women in different levels of their lives in businesses, to not only mentor other women, but give them tips to be successful. So we had it, and it was great. It’s all about those authentic connections, and instead of just an exchange of business cards, you actually do something and follow through. I did over 15 workshops over the course of six months about career building, public speaking, and how to act like a boss; the Werkbook came about to show how to make goals and execute them effectively. I literally just wrote a book and I was going to do a workshop about it and it kind of just took off. It’s nationwide now. It’s been a real blessing! To answer your Curvy Cardio question, the Curvy Cardio anniversary is in May – its fourth year. I’ve trained other instructors now, so I’m down to one day a week. When the personal brand took off, I had to keep canceling classes because I would get speaking engagements in Baton Rouge or somewhere else. I didn’t want the momentum to die down but I also wanted to empower the next generation of instructors to do their own thing. Curvy Cardio is still going strong. I have an online program called 30 Days of Werk that UC Health has sponsored the past three times, and that touches people that just don’t live here in Cincinnati. The 30 days are 30 days of empowerment. You have to get moving every day and post a motivational quote. I see Curvy Cardio empowering other chapters in other cities. I love it; it’s my baby! You picked Blush for our chat today. How come? 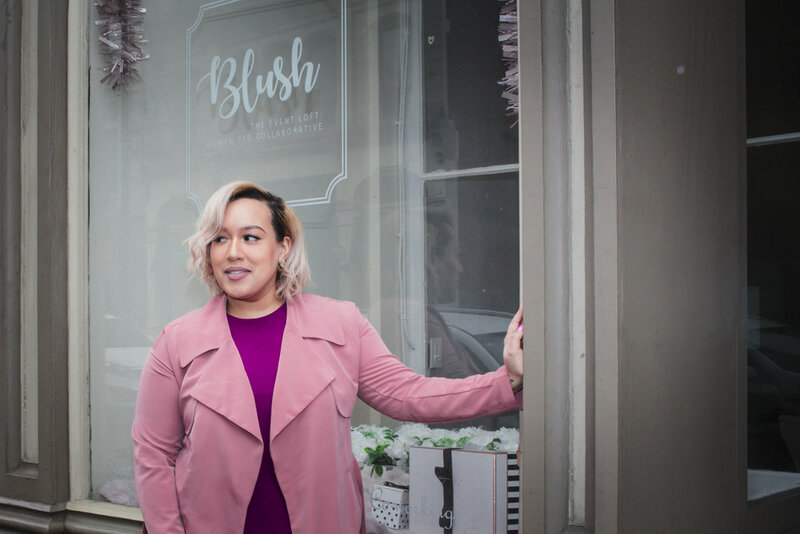 Blush is a space where women entrepreneurs can come and basically have a seat at the table and collaborate on their work. It’s been a blessing for me because I’ve done most of my workshops here. The owner, Simone Charles, started over at Court Street and we outgrew the space, so she moved over here. It’s been a blessing and opportunity for women in business to have a space where they can meet, put on events, and feel like a real boss. What motivates you to get up in the morning and continue to do what you do? What motivates me is the feedback I get from my clients, and like I told you, growing up with self-esteem issues, there was a dark time in my past where I didn’t want to wake up in the morning and didn’t want to be here. I say every day that it’s a blessing to even be here. If no one else believes you can do it, do it anyway. Let their doubt be your motivation. If I wasn’t here, I wouldn’t have impacted so many women, whether through Curvy Cardio – getting their self-esteem together – or the business side. That gets me up in the morning – that energy of making everyone successful! I believe everyone can be successful, achieve their goals, and live out their dreams. Knowing that someone believes in them can make a huge difference. My advice would be: Even if no one else believes you can do it, do it anyway. Let their doubt be your motivation. Your greatest power is believing in yourself and your capabilities. Even if you fail, you still succeed because you went for it. Life is too short to live how others want you to live. Did you have anyone along the way that helped you get to where you are today? Of course! It takes a village, you know. When people say they’re self-made, I get sad for them because I’m not self-made. I’ve had a whole tribe and community that’s supported me. Definitely Jan-Michele Lemon Kearney, editor of The Cincinnati Herald. She sponsored the first Babes in Bizness, and I just told her my idea and she was like, “I love it!” It takes that one person to tell you yes. Definitely my former boss from my corporate job. Her name is Lisette Martinez; she put me in a position where I didn’t feel like I was worthy and she said, “Yes you are!” There’s been a lot of people along the way and I am very fortunate and blessed to have them all. Do you have a woman or women in your life that motivate you to be better? My mom is my best friend. She stayed at home with us until we were old enough. My brothers and I are all four years apart. Just looking at her and knowing she goes to work every day with a smile on her face... She is the one who really instilled in me to help others to make you feel better about yourself. And she was right, like a mom! Helping others, no strings attached, makes you a better person.